Bees for development’s welcoming shop, just off historic Agincourt Square in Monmouth, offers a unique range of gifts from both locally-produced and African honeys, Welsh mead, honey beer and treats to natural cosmetics featuring honey and beeswax. 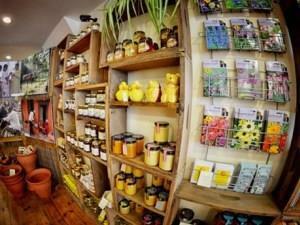 We also stock beeswax candles, bee-decorated chinaware and a range of books – plus bee-related paraphernalia. Proceeds from shop sales go to support our work around the world where we promote beekeeping as an effective and sustainable means of poverty alleviation. Bees for development is a unique, independent, Monmouth-based charity.